Merging scrapbooking and home decor, this memory hoop is a great way to display your favourite photos creatively, offering a constant reminder of happy times spent adventuring. We’re using the wonderful Lost & Found collection from Dovecraft, which lends itself perfectly to this make! Follow Kathy’s tutorial and learn how to create your own below! 1. Remove the outer embroidery hoop and place the inner hoop on the reverse of a piece of patterned paper and draw round it using a pencil. Cut around the pencil line leaving about a 1cm gap. 2. Snip all around the edge of the circle as far as the pencil line. 3. Draw around the inner hoop on a second piece of paper, drawing only half way round. Cut a line straight across the centre of the circle then cut around the semi-circle edge. 4. Cut a 1cm wide strip of contrasting paper the length of the semi-circle and secure in place along the long edge. 5. Place the first piece of paper, facing downwards on top of the outer frame. Place the inner frame on top and push in place. Secure the paper in place and tighten the hoops together using the adjustment at the top of the frame. 6. Fix the semi-circle to the first paper using foam pads or foam tape. 7. Fix narrow double sided tape along three edges of a hexagon wooden frame and place on top of patterned paper. Cut or trim around the edge of the paper. Repeat this process with a map and a photograph. 8. Fix the first frame behind the semi-circle and layer the other two frames on top, using foam pads. 9. Die cut a camera, ‘Good Times’ tag and a compass. 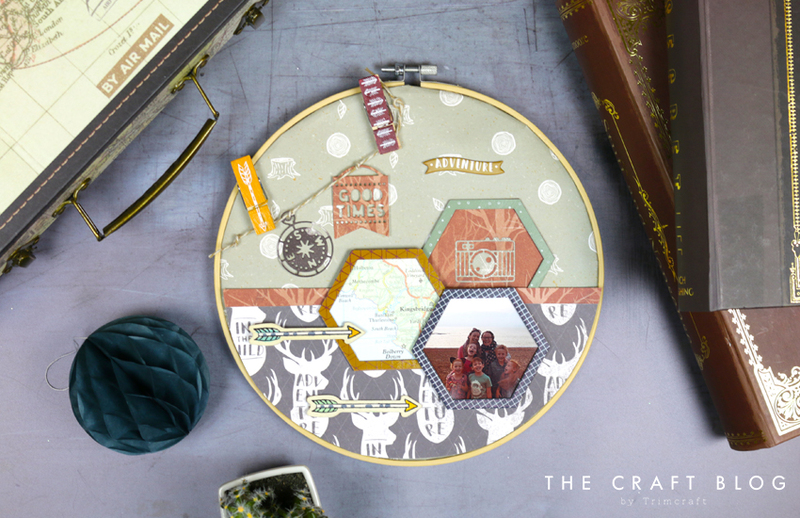 Fix the camera on top of the paper inside the hexagon frame and thread the tag and compass onto twine. Glue two midi pegs to the top right of the hoop and secure the twine. Tie a not in each end of the twine. 10. Fix two arrows on the semi-circle and the ‘Adventure’ puffy sticker in the top right of the hoop to finish. Your memory hoop is now complete! What do you think of this memory hoop idea? We’d love to know if you give this a try, so don’t forget to tag @kathycraftstv and to #Trimcraft when uploading to social media and to share you projects in the Inspiration area. This is a great idea Kathy, love it.